Sign up here for our newsletter to get our subscriber only discounts. Want to see photos? Full gallery below. Interested in a catered ski getaway with your own private chef for you and your family/friends? Maybe you prefer to come and go as you wish to our Apartment Paradis? Click here to see our prices and availability for the 2019 season. 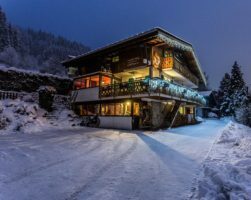 Chalet Morzine offers luxury winter and summer catered and self-catered chalet holidays in the alpine resort of Morzine-Avoriaz in the French Alps, just over an hours drive from Geneva airport, Switzerland. 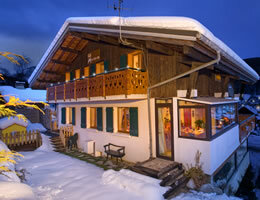 We are focused on the family and professional ski holiday, and offer a boutique holiday experience. Lindsey (English) and Thierry (French, ski instructor from Morzine) run this small exclusive chalet business out of their own unique family alpine retreat. 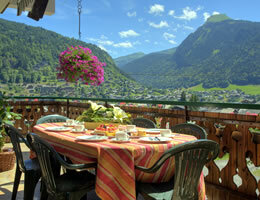 Chalet Morzine is in the most amazing location, being both ski in ski out, yet totally central to Morzine village centre. The elevated position of the chalet affords the most spectacular views over the town and mountains of Morzine-Avoriaz, particularly great from the huge outdoor hot tub. Sleeping up to 16 guests in 7 bedrooms this fantastic chalet offers the perfect family holiday accommodation for your catered winter ski break or your self-catered or catered family summer holiday. Recently added to our rental properties we have a gorgeous self catered apartment, Apartment Paradis. For those of you in the know, this has been built underneath our new home and is a beautiful two bedroomed apartment, sleeping up to 4/ 5 in two twin/king bedrooms. 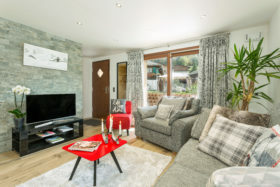 Fully equipped with everything you need for that fantastic holiday and run with the same attention to detail as Chalet Morzine, its that great alternative for a quick getaway to the Alps!